There are a number of conversation pieces in Jeff and Karen Armour's 10,000-square-foot French-country-style home in Orange County, Calif. It has a man cave with a golf simulator and a glass conservatory with heated floors. But the highlight is the couple's elevator—a $55,000 homage to Karen's coal-miner grandfather. Clad in repurposed barn wood, pipe metal and wire mesh, the elevator is decorated to resemble one that might be found in a mine shaft. On display is a photo of Karen's grandfather and his mining crew, his framed mining certificate, a lunch pail his wife packed for him every day and a carbide light from his miner's helmet. Some items are held up by nails that once pinned down his mine's coal-car rails, and a sign on a wall reads: "Danger: Blast Warning!" For her 3½-year-old grandson, riding the elevator "is like Disneyland," says Ms. Armour, an interior decorator whose husband Jeff is a real-estate investor. In high-end homes, elevators are going beyond their utilitarian purpose as insurance against accident and old age. Some are design statements; others have themes. They come lined with granite, wood paneling or wall paper. There are high-tech control panels, custom lighting schemes for art and glass panels to show off a home's views. "If you asked 10 years ago, I would say people were putting in elevators mainly for accessibility," says Chris Harris of A+ Elevators and Lifts in Salt Lake City. "Today 90% are status symbols." Installing a basic elevator starts in the mid-$20,000 range, and the prices go up from there, says Dave Russo, president of Access Elevator, a residential-elevator company in Farmingdale, N.Y. Elevators also are growing in popularity as the population ages. "We're in the second year of baby boomers retiring, so how many (potential buyers) are you taking out of the mix if you don't have an elevator?" says Mike Burke of Irvine, Calif.-based McKinley Elevator. 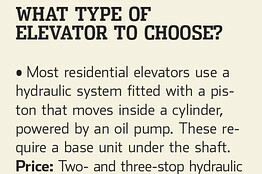 Planning a custom elevator can involve an architect, an interior designer, a general contractor, an engineer, a lighting specialist and artisan-level subcontractors. Glass-door elevators open up additional design possibilities because passengers can see the shaft's walls as they travel up and down. Mr. Burke of McKinley Elevator recalls a client who decked out his elevator cab to resemble a submarine. "He put little round windows in, had a [shaft wall] mural painted so you see fish and mermaids going by and piped in the sound of bubbles," he recalls. Many clients want elevators that maximize views, like the San Francisco client of Toronto's UT Elevator who wanted his glass elevator to show off vistas of the Golden Gate Bridge. That elevator is under construction. Andrew Williams, a general contractor in California's Orange County, was the point person on a team that built a $1 million-plus cylindrical glass elevator with views of the beach, part of an 11,000-square-foot, midcentury-modern home in Dana Point, Calif. Included in that price was a $500,000 spiral glass stairway that wraps around the elevator (allowing people standing on it to watch the elevator move) and the services of what Williams calls "an all-star team" of design and engineering professionals. The team won Elevator World magazine's 2014 residential project of the year award. That elevator is "really is a centerpiece for the architecture," says Mr. Williams, noting that every piece of it, including the control board and accessories concealed inside a stainless steel shroud, was a one-off, custom-designed prototype. Feb 1 Composting is Awesome!